Today's Hero: Newark Mayor Cory Booker, For Going Into A Burning Building : The Two-Way Now he's trending on Twitter after leading a woman to safety from her burning home. He's even said to be tougher than Chuck Norris. If you haven't heard by now, it seems that when he got home late last evening Mayor Cory Booker (D) of Newark, N.J., "saw flames and smoke from the second floor of the building next to his home," The Star-Ledger reports. The mayor and three members of his security detail went into the house, Booker said afterward. They thought they had helped everyone get out, when they heard a woman's voice cry from inside: "I'm upstairs!" 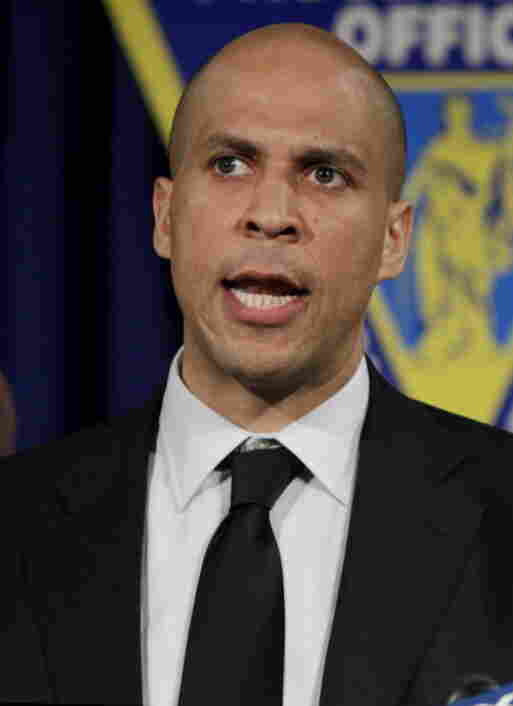 Booker told the Star-Ledger that, over the objections of one of his security officers, he went back in. The mayor got to the second floor, which was in flames, and couldn't find her at first. Then, the Star-Ledger says, "he heard her cries in a back bedroom. 'I just grabbed her and whipped her out of the bed,' Booker said. The two made their way downstairs, where they both collapsed, Booker said." He suffered smoke inhalation and burns on one hand. You might recall that back in December 2010, Booker generated headlines when he "joined his public works team to clear streets and run errands for snowbound citizens." At one point he was delivering diapers to desperate families. -- "And why do you think the North Korea rocket launch was thwarted? Cory Booker." -- "Cory Booker won the Kobayashi Maru." -- "Cory Booker doesn't run into fires, fire runs away from Cory Booker." -- "Cory Booker isn't afraid of Friday the 13th. Friday the 13th is afraid of Cory Booker." -- "When there's something strange in the neighborhood, who you gonna call?" Some of the best are also being collected on Tumblr. The mayor is due on NPR's Tell Me More later today. We'll update with a highlight or two from that conversation. Back in 2009, some may recall, Milwaukee Mayor Tom Barrett (D) got accolades — and suffered serious injuries — when he intervened in a domestic dispute. Moments ago on Tell Me More, host Michel Martin spoke with Booker. He told her that "most people in America would have done the same thing if your neighbor's screaming for help." And he went in to find the woman despite the objections of his security detail, Booker said, because firefighters hadn't yet reached the scene and he thought "if we don't get in there now, this whole place is going to go up and she's going to pass away." Once he had made his way back to the room where the woman was, though, the mayor says he thought he might not come back out alive. "I felt fear, frankly," he told Michel. It was difficult to breathe, flames were racing. But then he heard her call out again and found the woman. "I put her over my shoulder and sprinted back through the fire," he said. Speaking to reporters a moment ago, Booker said "it's over the top" to say he's a hero. He did what any neighbor would do, the major added. And, he noted, his security agents and firefighters were on the scene as well.